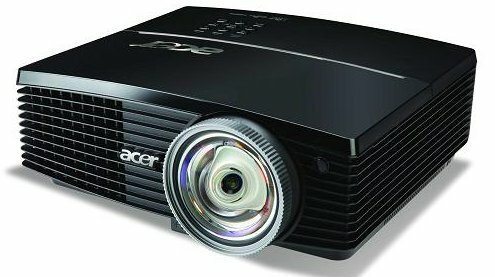 TechDigest reports Acer has a new 3D video projector, the S5200, this device uses DLP 3D ready technology and operates at a 120Hz refresh rate. Connectivity includes 2x component video, 1x HDMI, S-Video and composite. In the UK it will retail for £649. The projector is able to produce 3D imagery by using DLP 3D Ready technology. Using 120 Hz refresh rates, it can transform a flat surface into a 3D screen thanks to a combination of a PC with a compatible graphics card and special 3D glasses, producing two images on the screen at once which your mind processes as one. A short-throw projector, the S5200 can deliver an 81 inch screen from as little as a metre away. Acer's ColourBoost II + tech should also ensure colour performance remains solid, no matter what the ambient lighting conditions. The lamp is said to have a respectable 4,000 hour life, with a contrast ratio of 2,500:1. Brightness levels max out at 3,000 ANSI Lumens, which should make daytime viewing comfortable.